The next couple of weeks we’re going to spend some time focusing on turning ugly houses into pots of gold. It is true that you make your money when you buy a property. It’s not money that will fill your pockets if you’re buying and holding as a landlord does. It’s what they call unrealized income. It shows up on paper but it’s not anything you can spend until years down the road when you are ready to retire or start selling them off a few at a time. The road to real wealth is by using a buy and hold strategy in real estate. Flippers and wholesalers end up working their tails off on each and every deal they get. They also pay the government very well with their short term capital gains. And when they stop hustling their income stops. This is why you don’t see many flippers and wholesalers that are extremely wealthy. There are a few here and there but there are WAY more landlords that have made it in the multimillion dollar range. And with much less effort. Landlords get the benefits of buying property, keeping it and having their tenants pay off the mortgage, insurance, maintenance, taxes, etc. They also have the added benefit of depreciating the property over 27.5 years, mortgage interest deductions and many other benefits to buying and holding property. Such as extra pocket cash from each rental every month if done correctly. And unlike flippers and wholesalers, they can completely stop working for years but their income will keep rolling in. Landlording is the true definition of farming your mailbox. One very important step to successfully landlording property requires finding properties that need a substantial rehab. Buying properties in rough shape and doing a major rehab is the secret to obtaining 100% financing. And it helps tremendously with the growth of your company if you can get all of your money back out and put it into a new investment. So you’ve got to get something that you can put some sweat equity into to dramatically increase it’s value. Done correctly you will easily be able to get all of your money back out and reinvested. 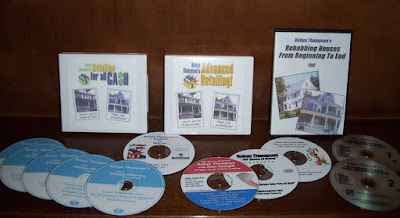 The next couple of weeks we are going to listen to some Guru CD’s about rehabbing houses. They aren’t very long so we will have plenty of time to have a group discussion about rehabbing for both flip and landlord purposes. We will discuss the full spectrum of how rehabs should be managed so you have a firm understanding of what you do and don’t do for a flip and rental. Come on down to our weekly shindig and spend some time with some educated like minded people. Attending REI once a week will keep your eye on the prize at the end of the path. It’s easy to get off track and real important to maintain focus if you have plans on retiring with more money than you know what to do with.